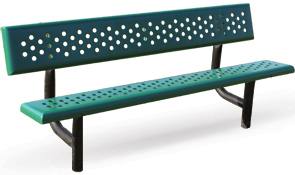 These Traditional Style Park Benches are perfect for any outdoor recreational area, especially sports fields. Baseball, soccer, and football players alike will all be able to "get a quick breather" on the comfortable, perforated steel Seat/Backs that allow for refreshing air flow and help limit heat exhaustion. Available in In-ground or Portable/Surface. Models available in both 6' & 8' lengths. 13 Gauge Perforated Steel Seat/Back. Hot dip galvanizing process results in an effective corrosion resistant surface with multi-varied spangle appearance. 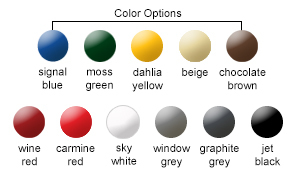 Polyester powder-coating process, available in either a gloss or textured	finish, starts with a state of the art application of an 'Electrocoat Zinc Rich Primer' combined with a durable polyester powder-coat top layer to ensure every crevice and joint is completely sealed, providing full protection against corrosion.